A Tarp Shelter You Can Easily Make! Having options and knowing how to execute those options in a survival situation can make the difference between a tolerable situation or a “very bad day.” One skill that every prepper and outdoor enthusiast should have is the ability to make a shelter. Tarp shelters have been around for a long time and there are many different types that you can make. But one type that has always stuck in my head is a tipi tarp shelter. 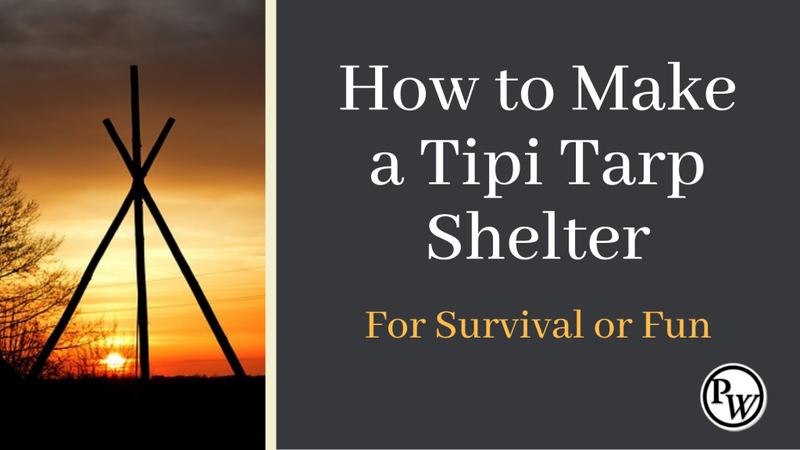 The idea of a tipi tarp shelter resurfaced the other day when I was talking about shelters on the podcast. I remember a video by David Wendell of Bushcraft on Fire when he made a tipi tarp shelter with his son. Building this shelter might take a little bit more time than a quick lean-to, but a tipi can sleep many more people than a lean-to shelter. So if you have a family, this might be the type of survival shelter you would want to familiarize yourself with. The materials for a tipi tarp shelter are minimal. Of course, you will need a tarp. In the video below, David shares that a tarp should be double the width than the length. In the video example, David uses a 20′ x 10′ tarp. Also, remember that the length of your tarp will tell you how high your tarp will be. In a 20′ x 10′ tarp, the height of your tipi will be 10 feet. You will also need poles. To save cutting down trees on his property, David purchased 5-7 2′ x 2′ x 14′ boards. He rounded off the top 3′ to allow the poles to lash together and sit more easily. You’ll also need tarp snap clips (you need these if you use tarps), cordage and a marker. David walks you through how to mark off your tarp so that you can actually place the snap clips in place and stake down your tipi tarp shelter. The only thing I wish he would have shown is the wrapping of the tarp around the poles and the tying off of the top. David explains what he did and you get to see it in the video, but it would have been nice to see it done. The video is a great example of how you can take something like a simple tarp and provide your family with a shelter in an extreme circumstance. Or, it could be something that a family does just for fun.